Click the button below to add the Tree of Life silver earrings handmade in Cambodia to your wish list. Are you looking for ethically produced jewellery that is also of high quality and stylish? Perhaps you are looking for a meaningful gift? Or something to spoil yourself? This beautiful and elegant pair of earrings is based on a tree of life design that alludes to the interconnection of all life on our planet. Enjoy wearing this delicate pair of silver earrings for many years to come - also makes an excellent gift for a friend. For information on how to care for this product please click here. 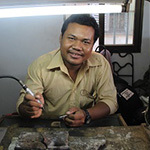 Rajana provides jobs to artisans located all around the Kingdom of Cambodia. By having workshops in several cities as well as several small villages, it brings fair trade to all reaches of Cambodia. There are many talented artisans throughout the country and it strives to work alongside them to help share their skills with the rest of the world. Rajana is registered with the Cambodian government as a local association; a non-profit group owned by its members. Rajana is a member of Artisans Association of Cambodia.